This article, the third in a series, looks at the ways of developing the inner light and awakening your life energies. 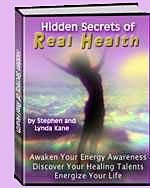 Stephen and Lynda Kane are authorities on bio-energy, relationships, and energy healing. Whenever something goes wrong in your life, that negative change is preceded – often over many years – by a change in your body's energies. The same goes for when anything – your health, wealth, relationships, creativity and so on – gets better. As a rule, these changes of energy occur unrecognized because people are rarely aware of their own energies. Everyone has an occasional "gut-feeling", an "intuition" or other such sense of something, but it tends to be vague, sporadic and altogether unclear as to what's going on and what you need to do about it. It's not easy to hear that quiet voice in the hurly burly of everyday living. Developing your awareness of your own energy provides you with a means of making choices that lead to a much better future than otherwise. It can also open up a whole new world for you – an almost "magical" world of energies that is constantly affecting you and your life but is normally unknown and unperceived. There are many ways you can develop your energy awareness – meditations, mantras, breathing techniques, exercises, etc. – and also many ways you can damage yourself in the process. You won't hear much about this subject from exponents of the many forms of "personal development", but human energetics is a highly complex subject and any technique has multiple primary and secondary effects – most of which remain unrecognized even by senior practitioners. The most common form of problem-generating personal development method is that which "robs Peter to pay Paul" – it takes energy from one area of your body (e.g., your heart) in order to increase a form of awareness in another area (e.g., your mouth). This causes problems by increasingly weakening the first area, as well as damaging the second area with an inappropriate form of energy. A relatively well-known example of this is the increased incidence of heart attacks amongst serious practitioners of the Cabala. But side-effects don't have to be dramatic to significantly impact your life. At this very moment, there are innumerable people practising meditations, exercises and personal disciplines designed to generate some form or other of higher awareness, who are unwittingly generating long-term side-effects in their health, creativity, relationships, happiness, balance of consciousness and so-on – as well as only achieving partial results. In the "New Age" world, there is a common tendency to believe that, "anything is okay". However, if you choose to make the effort required to develop a stable, concrete, "whole body" (rather than partial) energy awareness, you will come to see that many popular products, teachings and techniques either are not as they claim or they also have consequences that are not mentioned on the "label". A friend of ours, Sylvie, decided to attend a workshop on "dance-meditation." Soon after starting one of the movements, she began to feel unwell and stopped dancing. The teacher advised her that she needed to continue in order to "break through the barrier of her resistance"(?). After the class, Sylvie became worse. When we saw her, she'd been experiencing nausea and a headache – in spite of medication – for several days. Sylvie showed us the "moves" she'd been taught in the class. One of them caused a dark lesion to appear in the energy over her upper abdomen and the right side of her head. Since she liked dancing, I taught Sylvie a simple movement or "weave" that sealed the energy over her head and abdomen. She recovered before she went to sleep that night. If Sylvie's teacher had developed her energy awareness, she would have seen that the movement was inappropriate for Sylvie. If Sylvie had developed sufficient energy awareness, she would have immediately seen that the movement was no good for her – or for many other people. Imagine your awareness as a television that, potentially, can receive 30 channels. Channel 1 is called, "Awareness of this Physical World" (aka APW). You have a lot of attention dedicated to this channel so you are well-"tuned-in" to the physical world. Consequently, you are good at avoiding vehicles when crossing the street, eating food rather than breaking your teeth on rocks and generally dealing with the reality that you perceive. However, your body and mind are also being affected by energies that can only be perceived by tuning into other channels. Since almost all your attention is dedicated to channel 1 (APW), you are largely unaware of other, energetic "streets" or "vehicles," "foods" or "rocks" or anything else that is affecting you and your life, but is outside the range of APW. Many popular personal development techniques are intended to "wake up" one or more channels in you. Unfortunately, while method X is diverting more of your energy to channel 2 or 23, it may also be messing up your energetic "circuitry" – the circuitry that keeps your body and life functioning correctly. In other words, personal development techniques often act rather like drugs – with the usual host of possible side-effects that the doctor forgets to mention. When an area of your internal circuitry is affected in this way, you may develop some awareness of another "channel," but become less capable, over a long period of time, in one or more areas of your life and/or health as a direct consequence of using a particular, energy-stealing technique. Energy awareness is an invaluable asset that can dramatically increase the quality of anyone's life. However, the best way to develop your awareness of your and others' energies is to employ techniques that steadily develop your whole body's energy awareness – which prevents your being weakened or damaged in the process. The following method is taken from our personal mentoring service, Vision*Empowerment. It helps you start developing a whole body energy awareness without misallocating any of your essential energies. It works by causing a descent of mana or "sky energy" (see Under a Positive Sky: Living in a High Energy Place) into your crown. This is then distributed throughout your body to increase the forms of awareness that you, personally, currently most need in order to deal more effectively with the conditions of your life. In other words, different people experience different benefits, each according to her needs. Cultivating the energy awareness of your whole body isn't an easy ride. Contrary to some organizations' or individuals' claims, there is no machine, medicine, music, mantra or master that's going to catapult you into a stable state of higher awareness without considerable effort on your part. Developing a genuine higher awareness is not a lot different from developing your muscles – it takes plenty of "sweat" and, possibly, some "blood" or "tears" as well. However, as for muscle-building, there are all kinds of ways to facilitate and encourage the process. Making use of your living environment – where a multitude of energies are already affecting you day and night – is one way of going about it. The following method – the Dawn Light – is a basic Kitai, or "Awareness Feng Shui" seal that can be practised by anyone, without having already developed any energy awareness. So it's an ideal way to start entering your own path to higher awareness. Strongly concentrate on feeling your breath at the tip of your nose while fully inhaling and exhaling – the more you focus on feeling your breath, the less attention you have for thinking or imagining. The bedroom environment acts as a container for a form of mana (see Hidden Secrets of Real Health) that increases the flow of vitality (sexual energy) up to your crown (chakra). This flow is cultivated by the breath meditation, which you should also try to resume if you wake up during the night. Awareness of how your energies are affected by your actions – what you say, think, eat, do for a living, do for fun, etc. This "seal", or empowerment process, is called the "Dawn Light" because, when practised diligently, it generates a growing experience of seeing the world in a new light – as if everything you've seen before you've only half-seen . . . and everything you've believed or "known" must be reconsidered. Real energy awareness profoundly changes your view of life, the world around you and your own capabilities. If you wish to practice the Dawn Light empowerment, but you have a problem with one or other of the requirements (eg. there's only one door between your bedroom and the toilet), we may be able to help you remedy it. Also, if you decide to practise the Dawn Light, don't forget to sign-up at our website - www.realhealth-online.com. 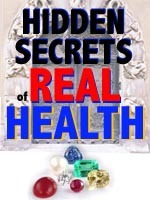 By doing this, you'll occasionally receive useful information about some of the other seals in Hidden Secrets of Real Health.